What do a 1940s Toyota car factory and many modern software companies have in common? They all use Kanban boards to reduce waste and increase efficiency—and so can you. Learn how you can use the Kanban project management methodology to improve your workflow like never before. The Kanban project management methodology is a visual system for managing work and improving workflow. Its name comes from the Japanese word kanban, which translates to “visual signal.” The name fits because the methodology requires the use of a Kanban board and cards to visualize process and work (more on that in a minute). When used properly, the Kanban method helps to eliminate bottlenecks and improve efficiency, which explains why many companies use it as a framework to implement agile methodology. In fact, the Kanban methodology was developed to improve the car manufacturing process. Back in the 1940s, Toyota wanted to improve efficiency in its production factories. They drew inspiration from supermarkets, which use a just-in-time system. In a just-in-time (JIT) system, companies only create goods as needed. This process works well for supermarkets because they can’t afford to have a surplus of food simply waiting in the back to be shelved. Rather, they use careful ordering to ensure they are restocking enough to meet demand without ordering enough to have a wasteful surplus. With this in mind, Toyota introduced a card-based system in their factory to reduce inefficient inventory. Rather than keep as many of each part as possible on hand, using up valuable space, the factory began keeping a smaller, finite number of each part. When they needed more, workers would take a Kanban card to indicate they needed to replenish their part supply, but only up to the limit. In this way, Toyota implemented their own just-in-time system and created a streamlined, efficient process. Over half a century later, in the 2000s, the software world adapted Toyota’s Kanban cards to create a viable project management methodology. In 2010, David J. Anderson, a founder of the Agile Project Leadership Network, published “Kanban: Successful Evolutionary Change for Your Technology Business,” the definitive book on the Kanban method. The Kanban methodology has exploded in popularity, largely because of its simplicity. The Kanban method uses a visual representation of process and work in order to identify and correct bottlenecks. Everything is represented on a Kanban board. 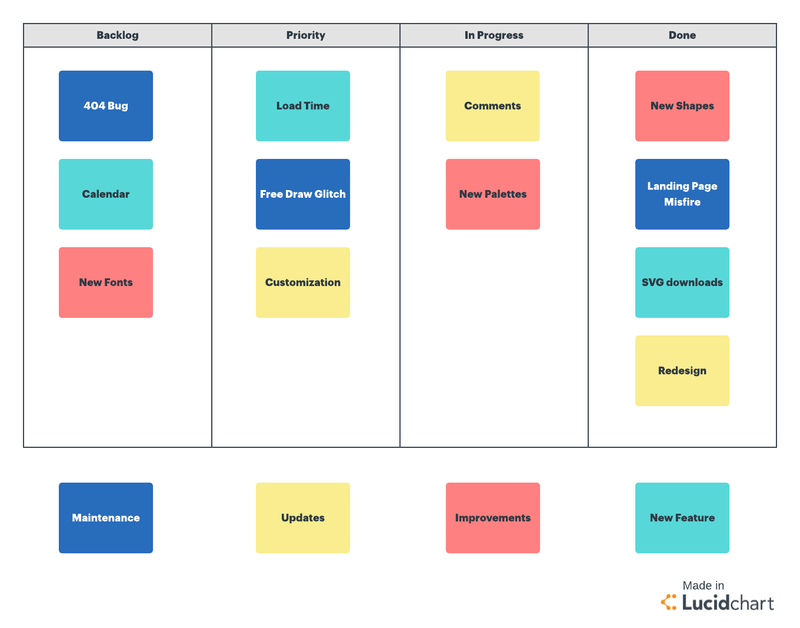 This board is traditionally a physical object—most often a whiteboard—that is easily viewable by the team, but virtual Kanban boards are becoming increasingly popular. You can use Lucidchart to create a virtual Kanban board to your specifications. At its most basic, the Kanban board consists of clearly labelled columns that denote work yet to be done, work in progress, and finished work. These columns may be adjusted to better fit your team’s process. For example, you might use “design,” “dev,” and “QA” columns rather than a catch-all “in progress” column. You can also include horizontal rows to designate swimlanes for work. Regardless of the specific columns and rows you decide upon, all in-progress columns must have an explicit limit to the number of items that can be in them at any given time. Items will physically move through the Kanban board’s columns as they move through the work process. These items are represented by Kanban cards. Kanban cards are generally sticky notes, index cards, or other similarly sized papers that represent a project. You can record pertinent information on these cards, such as due dates, relevant team members, or dates that the card moves columns on the Kanban board. Avoid the impulse to include too many details — the board and cards should serve primarily as a visual representation of work rather than a record of project details. Cards are initially placed in the “to do” column, commonly called the “backlog.” When work begins on a project, the card moves to the first in-progress column. Work is always pulled through the Kanban board rather than pushed (a push would occur when the delivering team is finished with their task, regardless of the receiving team’s bandwidth, whereas a pull depends entirely on the receiving team’s bandwidth). This pull happens according to each column’s WIP limits. If, for example, you’ve set a limit of two items in your dev column, nothing can be added to that column until there is one item or no items left. If design has finished a project but dev is already at capacity, the project continues to sit with design, creating a bottleneck. When dev finishes a project and it moves to the next column, they can then pull a card from design. As bottlenecks happen, your team should work together to eliminate them. In the moment, team members might have to step outside of their usual roles, perhaps pitching together to complete QA. However, the Kanban methodology is also concerned about long-term change. In order to effectively use the Kanban board, you must also consider how to adjust your process to prevent future bottlenecks. As your team visualizes its workflow, problems will become readily visible. Your team should adjust process as necessary, essentially using experimentation to perfect your workflow. You might have to adjust the column limits, rethink swimlanes, or make other changes. As you refer to the Kanban board, you can make small, effective changes based on the data in front of you. As you follow the process described above, make sure to keep these principles in mind. Keep your Kanban board highly visible, and update it frequently. An accurate visible representation of your process allows you to spot problems and address them, in addition to helping your team improve communication regarding project status. 2. Limit work in progress. Set a WIP limit for each column, and stick to it. This limit prevents a loss of efficiency due to multitasking or re-prioritizing. You will likely have to experiment to find this appropriate limit, but a common rule of thumb is to start with two items for each person working in that column. The Kanban methodology works to achieve kaizen, or continuous improvement. You should use your board to identify problems and make changes to fix them. Some users suggest that Kanban is more accurately a process refinement system rather than a project management system. If you have decided to incorporate Kanban methodology into your project management style, review these four steps to ensure that this workflow increases efficiency on your team. 1. Make explicit process policies. Kanban methodology only works if everyone on the team knows how it functions. Once you define WIP limits, make them visible on the board. Ensure that all team members understand how work is pulled through the board, and establish expectations for addressing bottlenecks. Don’t simply visualize your workflow—manage it. Define important metrics, such as how long it takes an item to move through the board, and use these metrics to improve your process. When you see bottlenecks, take steps to prevent them in the future. Actively engage with the information you get from the Kanban board rather than passively observing it. Decide upon regular intervals to review the data on your Kanban board. Set up a review at a defined time (every two weeks, for example), as well as whenever problems become clear on the board, such as bottlenecks. Regular feedback ensures continual improvement. Kanban methodology relies heavily upon the investment of team members to make it work. So work with your team to address problems and correct bottlenecks. This helps you improve processes in ways that a manager alone might not consider, and it keeps team members invested in making things work. What do you stand to gain after following all of these principles? Take a look at some of the benefits of the Kanban agile methodology. The Kanban method requires very little to get started—just a Kanban board and cards. This low start cost makes it very easy to implement the Kanban methodology. Likewise, the simplicity of the system makes it more likely that your team members will understand it and use it appropriately. The Kanban methodology can work with many kinds of teams and many kinds of processes. In fact, plenty of teams use the Kanban methodology in addition to another system (like waterfall project management). The flexibility of the columns allows Kanban to adapt to your team’s workflow without needing to remove whatever systems you have in place already. Kanban methodology can work well for teams whose priorities may be in flux. While the WIP limits must remain firm, you can reorganize the backlog column as necessary without affecting the workflow. Since new work is always taken from the top of the column, you can put whatever is most important up top to guarantee it gets taken care of next without disturbing anything in progress. The WIP limits keep teams from losing efficiency through multitasking. While some managers are concerned about having fewer projects in process at any given time, many teams find that the WIP limits help them deliver work more quickly. Because the Kanban methodology focuses on improving workflow, it benefits your team in ways that other project management systems don’t. It doesn’t simply get projects done—it gets them done better. Your team should continuously improve, advancing your process as you reduce waste and speed up delivery. The Kanban methodology encourages change based upon visualized data, so you don’t have to make sweeping changes. Instead, you tweak and adjust things as needed. This slower change eliminates resistance from team members and prevents you from accidentally making a change that seriously hinders your workflow. As evidenced by its leap from car factories to the software industry, the Kanban methodology is a versatile system that can work well for just about any team. If you’re ready to improve your workflow, there’s no reason you can’t implement the Kanban methodology immediately. Use Lucidchart to create your Kanban board, make your cards, and start streamlining your team’s process. Haven't signed up for Lucidchart yet?